W.b.c. 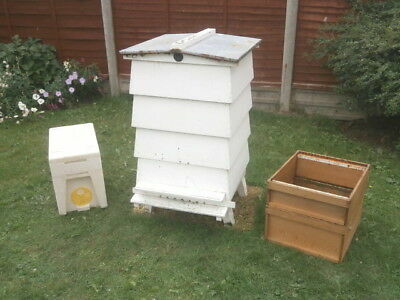 Wood Hive +Spare Brood Box & Super. Seller: 9157.7 (867) 100%, Location: MELKSHAM, Ships to: Free Local Pickup, Item: 153180602195 WOOD HIVE 41 INCHES HIGH BY 24 INCHES.MADE BY W.B.C COMES WITH BROOD BOX & 2 SUPERS,CROWN BOARD & QUEEN EXCLUDER. PLUS A FEEDER.ALSO POLY NUC.THE PLY ON INSIDE OF LID IS A BIT WORN & TIRED. THERE IS SOME SMALL AREAS OF RUST ON THE METAL TOP.THESE ARE ALL USED ITEMS. Condition: Used, Condition: SLIGHT RUST ON METAL LID & WORN PLY INSIDE., Modified Item: No, Country/Region of Manufacture: United Kingdom, MPN: Does Not Apply, Custom Bundle: Yes, Brand: WBC, Product Type: Beehives, Non-Domestic Product: No, Bundle Description: HIVE,SPARE BROOD BOX,FEEDER,POLY NUC. Popularity - Super high amount of bids. 2 views, 0.0 views per day, 223 days on eBay. Normal amount of views. 1 sold, 0 available. Super high amount of bids. 2 views, 0.0 views per day, 223 days on eBay. Normal amount of views. 1 sold, 0 available. Seller - 867+ items sold. 0% negative feedback. Great seller with very good positive feedback and over 50 ratings. 867+ items sold. 0% negative feedback. Great seller with very good positive feedback and over 50 ratings.